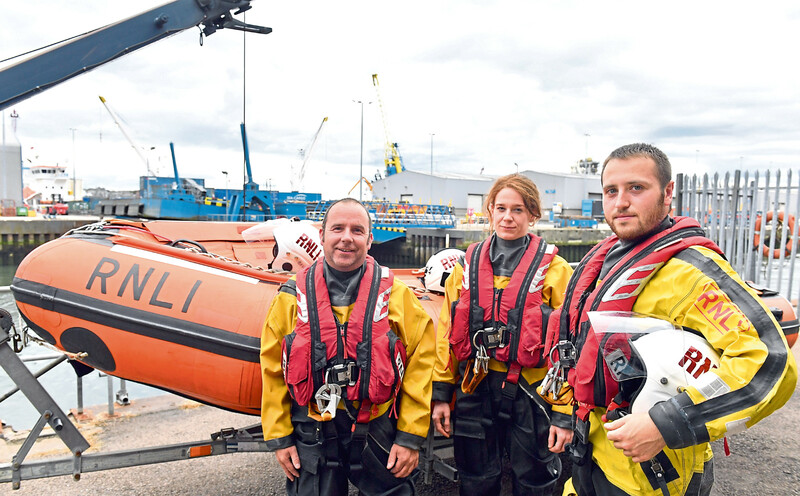 Our reporter joins the Aberdeen RNLI crew on a training exercise and asks – what does it really take to save lives at sea? Victor Sutherland (senior), Vic Sutherland (son), Declan Sutherland (grandson, Dave’s son), Dave Sutherland (son) and Albert Sutherland (twin brother) in Fraserburgh Harbour. Someone is trapped at the foot of the rocky cliffs around by Nigg Bay. A popular route with walkers, a person has fallen from a higher trail and become stuck on the uneven rocks with suspected injuries preventing them from calling for help. The tide is rising fast and the casualty is sandwiched between a sheer cliff face and the unforgiving North Sea, cold enough to induce shock even on the warmest of summer days. 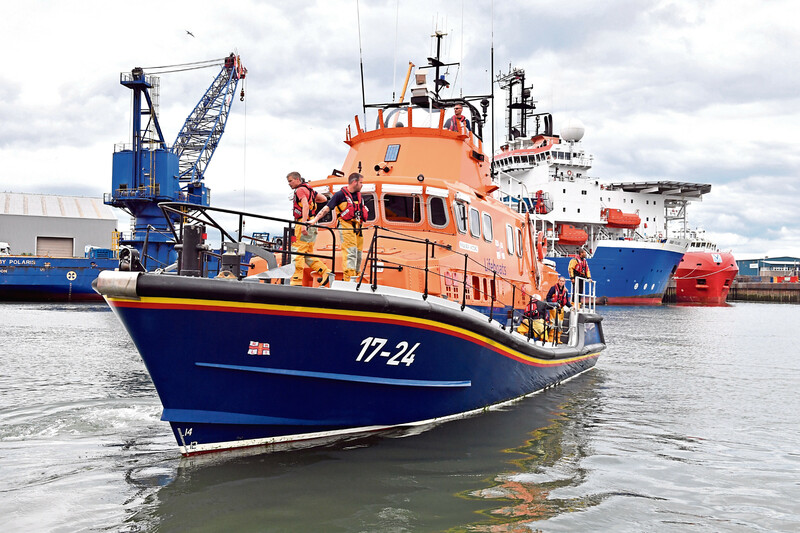 The all-weather lifeboat leaves Aberdeen harbour. With all the details relayed from the coastguard, the coxswain revs the engine of the orange Severn class, all-weather lifeboat and we speed out of the harbour. The unfortunate “casualty” is Dead Fred, a 15 stone life-size training dummy used regularly by the Royal National Lifeboat Institution (RNLI) on its practice drills. Today is a standard exercise for the volunteer crew who, together with crews up and down the country, collectively rescue an average of 22 people every day. The brilliant sunshine of earlier has been replaced by squally showers, which makes visibility rather hazy, even on today’s calm waters. But the crew are in full search mode, with the smaller inflatable D-class inshore lifeboat scouting out in front. It is incredibly difficult to spot a man stranded on the cliffs who, in all likelihood is hidden from sight, sheltering from the salt spray. This time we are lucky. As the Severn bobs a couple of hundred metres from shore, the smaller inflatable lifeboat has been scouring the crags up close and has located our casualty. Inshore lifeboar crew members Bruce Finnie, Hannah Nash and Stuart Gibb. A crackly voice on coxswain Davie Orr’s radio lets us know that apart from a suspected broken leg, Fred is none the worse for wear. “Although this exercise is close to shore, real rescues can see us up to 100 miles out to sea,” said Davie, 46. 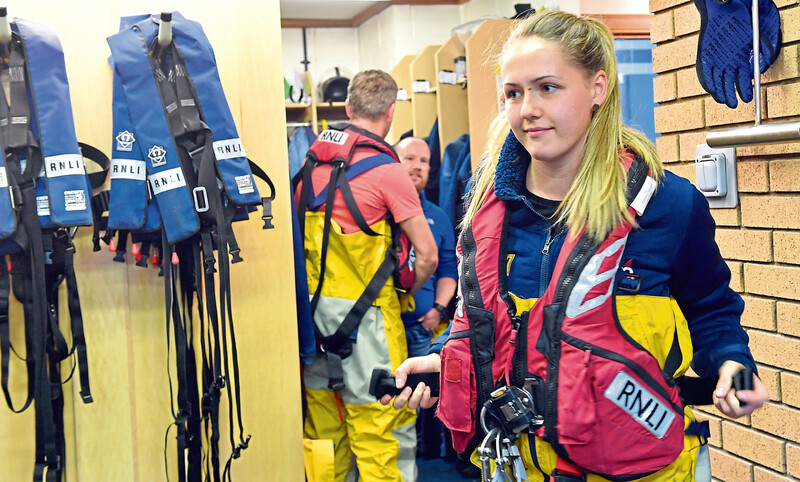 “I’ve been a volunteer with the RNLI 25 years and I think I’ve seen just about everything in that time. “Recently we’ve had a lot of hoax call-outs with people setting off distress flares, but there are some more memorable rescues that stick in your head. “I remember one day we arrived to find three men on a homemade vessel who were utterly incapacitated with seasickness. There are 238 lifeboat stations around the UK and Ireland, which operate 24-hour search and rescue services covering 19,000 miles of coastline. The stations are manned by 4,700 crew and another 3,000 onshore volunteers. In its near 200 year history, the charity has saved more than 140,000 lives and relies solely on public donations to maintain its service. “When a call comes through all the crew members get paged and everyone who is available heads straight to the station,” Davie said. “Most of us – including me – have full-time jobs too so it’s up to your employer whether they let you leave. “The coxswain will brief the crew on what we know, and individual crew members are selected for the rescue. “People all have different strengths and we like to make sure there is always a mix of experience on board. “It would be no use to anyone to have a crew entirely made up of new recruits on a job where you might be bringing home fatalities. To join the RNLI, volunteers must be physically fit, live close to a lifeboat station and willing to be on call 24 hours a day. Training is continuous and volunteers learn general seamanship, sea survival, rescue procedures and advanced first aid. 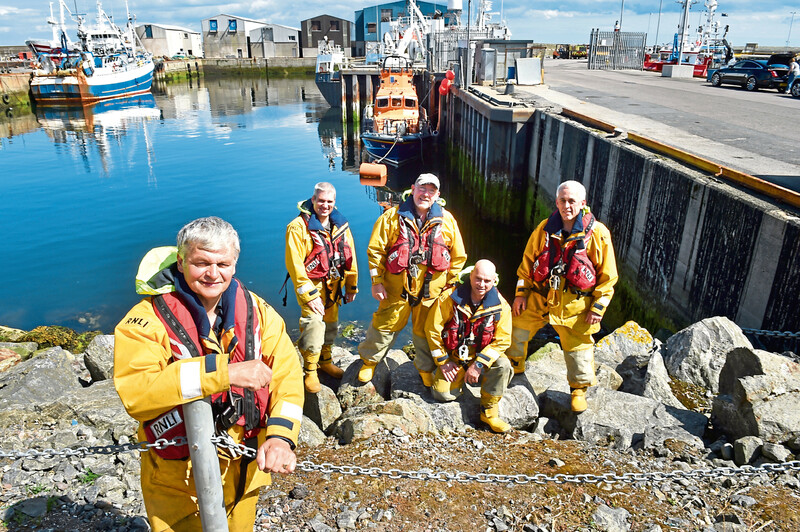 The crew of the Aberdeen-based all-weather lifeboat and inshore lifeboat get ready for action. On average just one in 10 crew members is a professional mariner but in Fraserburgh, as you might expect, this figure is much higher. In fact, The Broch is home to Scotland’s first RNLI station, founded in 1858. The town is also home to the Sutherland family, who have had a considerable impact on their local station over the years. 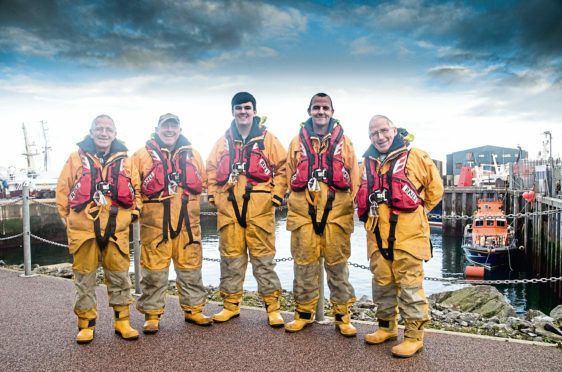 The kit is heavy, but 71-year-old Victor Sutherland has no trouble tugging on the iconic yellow waterproofs along with a pair of steel toe-capped yellow wellies and a scarlet life jacket. “I started as a volunteer here in the late 1960s,” he said. “I’m not sure what exactly inspired me to join but my father had a small boat in Scrabster which he used to take my twin brother Albert and I out on regularly. A few years later, Victor was working as a fisherman when his cousin John joined the service. Inspired, both Victor and his twin brother Albert joined up too, alongside their other brother James. “Albert was coxswain and James was second coxswain before he moved away,” Victor said. “Then I took over from him until I reached 60, which is the upper age limit for working on the boats. “I spent the next 10 years volunteering onshore instead, until last year when I reached the top age bracket for volunteers. “It’s sad to no longer be a part of the service but at least I can enjoy my retirement in peace,” he added with a chuckle. However, there is still a Sutherland presence in the Fraserburgh cohort today because, following in the footsteps of his father, Victor’s son Vic junior, 46, has been employed as coxswain mechanic by the service for the last 25 years. He is one of the few crew members to be officially paid by the RNLI and has a mammoth list of tasks to keep him busy around the station. Bleary-eyed and often woken from his bed, Vic is usually one of the first on the scene when the crew are paged – no matter the time of day or night. “Usually we are launched within eight minutes of the call,” he said. “And every rescue is different, whether it’s the weather conditions, the casualty or the level of crew experience. “April 2009 was the first major search I was involved in and you just go into autopilot really. At this point Victor senior interrupted to say: “You always remember your first call out. “And there are others over the years too that stay with you. There is a moment of silence as we process the information and recognise that without the lifesaving work of RNLI crews around the country, tragedies at sea would be a far more common occurrence. But it’s not just at sea where the RNLI has a presence, as the service also covers significant inland bodies of water too. At 23 miles in length, Loch Ness holds the largest volume of fresh water in Britain, and on its banks sits the only inland RNLI station in Scotland – there are three others in Ireland and four along the Thames. It has been in operation since 2008, and lifeboat operations manager Joanna Stebbings has worked for the station since the day it opened. “There are two main differences with us at Loch Ness,” she said. “First off are the conditions. Fresh water isn’t as buoyant as salt water so we are quicker to launch, but being less buoyant is obviously detrimental to the casualty so we need to get out on the water that little bit faster. “Prevailing winds are tricky too; because the loch is so long the water gets extremely choppy and much rougher than people expect. “The waves are different from waves in the sea because ours are only caused by the wind and not based on the tide. “Sea waves are more like rolls with rhythm whereas on flat bodies of water the waves are shorter and far more jarring. “Extreme temperatures have seen our crew out in minus 17 degrees Celsius, and this summer in conditions over 30 degrees so we need to prepare for anything. “Before we got our new boathouse this spring we had to continually dig snow off the lifeboat all winter. “The other main difference is the boat, because although it’s the same boat used at sea, we look after it differently here. The typical rescues at Loch Ness can be different too. Along with marooned boats or amateur sailors in trouble, the crew often deals with stranded walkers or even car accidents in which vehicles have run off the road and are only accessible by water. So whatever you’re doing this summer whether it be boating, a road trip or even just a wild swim on a sunny day, it would be wise to keep Dead Fred in mind. We can count ourselves lucky to have volunteers among us prepared to carry out this dangerous and lifesaving work.